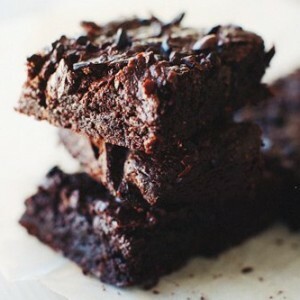 These brownies are decadent, very rich, and deeply chocolatey, so much so that even one with a fierce sweet tooth can have one small square and be satisfied. In a medium saucepan, melt the butter, then add the chocolate and stir over low heat until the chocolate is melted and smooth. Remove from the heat and stir in the sugar and vanilla until combined. Beat in the eggs one at a time. Add the flour, pinch of salt and stir energetically for 1 full minute, until the batter looses its graininess, becomes smooth, and begins to pul away from the sides. Stir in the chopped nuts of preferred add ins. Scrape the batter into the prepared pan, sprinkle the cocoa nibs on top and bake until the center is almost set, about 25-30 minutes. Don't overbake. Let them cool completely before lifting out the parchment to remove brownies.